Ancient Gadara was a Decapolis city, one of ten Greco-Roman city-states on the eastern fringes of the Roman Empire. Matthew 8:28-34 in the New Testament tells that Jesus cast demons from two men into a heard of pigs at Gadara, sending them running down the hill and into the Sea of Galilee. Today the Sea of Galilee is just across a national border from Gadara. This mystery country is Jordan. Click to see Jordan tours. 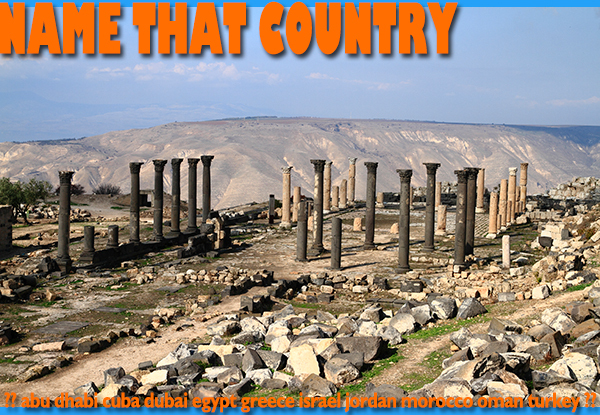 This entry was posted in Jordan, name that country quiz and tagged gedara, Jordan, jordan tours by yalla2013. Bookmark the permalink.